Is Stress a Developmental Toxicant? Stress is a term that can mean very different things under different circumstances. In toxicology, stress refers to any external challenge that disturbs the constancy of the internal environment, or homeostasis. This definition encompasses the neurochemical, physiological, and behavioral reactions to novel, dangerous, or upsetting situations. Stress isn’t necessarily bad; the endocrine and neural adaptations typically referred to as the “stress response” may cause a person to, for example, escape from the path of a moving car. However, these responses can be maladaptive in certain situations, especially in cases of chronic stress. Stressors can be environmental conditions or events, including excessive heat or cold, noise, chemical exposures, physical exertion or traumas such as natural and manmade disasters (e.g. famine, floods, hurricanes, or earthquakes). Traumas also include domestic violence or other types of physical or sexual abuse, conflicts with family members, or a hostile work situation, and neurobiological conditions such as the psychiatric disorders generalized anxiety disorder, panic disorder, and major depression. Although a considerable amount of experimental animal research has been done on the topic, far fewer human studies have been attempted. Because women and their life situations differ widely, such studies are difficult to conduct and interpret. The impact of stress depends on the type and severity of the stress and on the timing of the exposure. In animals and humans, there are windows of vulnerability during development such that the effects can vary depending on the stage of development. Although there has been much speculation, we know relatively little about mechanisms by which maternal stress could adversely affect pregnancy. The response to stress is a basic adaptive mechanism that is protective in times of crisis. Stress activates the sympathetic nervous system and results in the release of specific hormones, including catecholamines and glucocorticoids. In mice, it is the increase in glucocorticoids that appears to be the cause of stress-induced cleft palate (see Figure 1). Stressors may also alter activities of the immune, neural, and renal systems, as well as having additional endocrine effects. Any of these influences may, in turn, affect various aspects of a mother’s physiology and behavior, which then impact the developing fetus and the growing child. Figure 1. 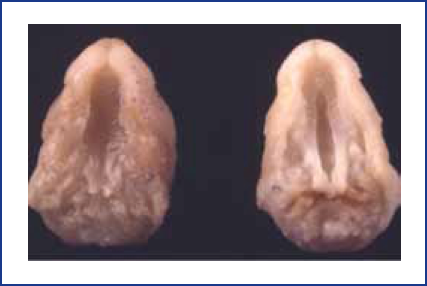 Cleft palate (right) can be induced in fetuses of susceptible mouse strains by maternal stress during pregnancy. Laboratory animal studies, most often with rodents, have tested the effects of such stressors as physical restraint, hypothermia, electric shock, noise, visual stimuli, vibration, shipping, and crowding on development. Deprivation of food and water has also been used as a stressor, but the possible effects of malnutrition confound these studies. Studies in pregnant rodents have demonstrated that certain maternal stressors can increase the adverse effects of chemicals known to cause malformations or other manifestations of developmental toxicity. Moreover, it is also possible that the stress caused by maternally toxic exposures to chemicals might exacerbate the harmful effects of those chemicals on the embryo or fetus. Numerous experimental animal studies have examined effects of maternal stress or excess glucocorticoids (hormones produced in response to stress) on the physiology (especially endocrine alterations) or behavior of the young at various times after birth. Some investigators have noted increases in the likelihood of disorders of cardiovascular function, glucose homeostasis, and anxiety related behaviors in the animal as an adult. Other investigators have noted mortality, decreased growth, or development of extra ribs in the embryo or fetus, and a few studies have reported stress-related malformations. These malformations include encephalocele and exencephaly (different degrees of defective development of the brain and skull) caused by failure of the neural tube to close normally during development of the embryo. There are clearly significant differences in susceptibility to maternal stress during development among species and even among strains of the same species. For example, it is generally easier to induce adverse effects of stress on growth, mortality, and anatomical development in mice than in rats. And in some strains of mice, maternal stress is associated with cleft palate, while other strains are unaffected. Several human studies have attempted to evaluate the potential for effects of maternal stress on development. Various clinical studies have associated an adverse environment during pregnancy with the development in the offspring of metabolic disorders and neuroendocrine dysfunction as well as an increased risk of neurobiological (psychiatric) diseases in later life. Some studies have reported increased incidences of low birthweight or preterm delivery, and a few studies have found diminished scores on neonatal neurological examinations. However, these human studies often have methodological shortcomings, including arbitrary measures of psychological stress or inappropriate comparisons between groups. These studies must also deal with possible biases, especially recall bias. Recall bias is attributable to selective memory. Women, who miscarried, gave birth prematurely, or who gave birth to abnormal children may be more likely than women with normal pregnancies to remember events that they believe may have contributed to such outcomes. This differential reporting may occur even when the life experiences of the two groups were not truly different. Prospective studies are more informative in assessing the effects of antenatal stress. Confounding factors are also common in human studies. Potential confounders include, among others, drug, alcohol, and tobacco use, socioeconomic status, and comorbid medical conditions. While poverty is a risk factor for adverse pregnancy outcomes, domestic violence and sexual abuse occur across all socioeconomic groups. Among other confounding factors are maternal and paternal psychiatric illness, medication exposure, and the postnatal environment. Any of these exposures could affect the results of a study on development. Thus, consistent human evidence for stress-induced effects on the offspring has been difficult to obtain. As in animal models, individual fetuses and children may differ in their neurobiological susceptibility to stress, based on their genetic makeup. Epigenetic mechanisms are increasingly being studied as the mediators of antenatal and postnatal manifestations of stress on the offspring (see Figure 2). Stress responses are complex and can vary depending on the stressor and species involved. Although adverse effects have been shown to occur in laboratory animals and in some human studies, determining possible mechanisms by which maternal stress might negatively affect human embryonic or fetal development remains challenging. Figure 2. Fetal antecedents such as maternal dietary deficiencies, chronic stress or infection can increase pro-inflammatory cytokines and stress hormones and can produce shifts in metabolic indices. 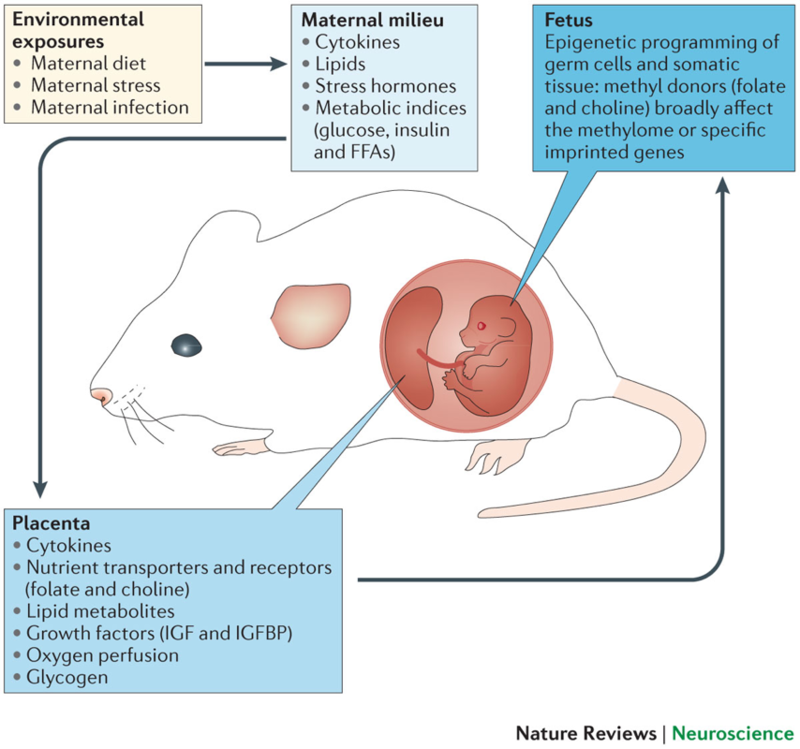 These environmental exposures can indirectly alter placental development and function by changing local energy metabolism and lipid storage and metabolism, which can alter the transmission of key nutrients that are important for fetal growth and brain development, including growth factors and methyl donor nutrients such as folate and choline, which can affect fetal somatic and germ cell epigenetic programming. FFAs, free fatty acids; IGF, insulin-like growth factor; IGFBP, IGF-binding protein. From Bale TL. Epigenetic and transgenerational reprogramming of brain development. Nature Reviews Neuroscience 2015;16:332-344. Used with permission. Andersson NW, Hansen MV, Larsen AD, et al. Prenatal maternal stress and atopic diseases in the child: a systematic review of observational human studies. Allergy 2016;71:15-26. Bale TL. Epigenetic and transgenerational reprogramming of brain development. Nature Reviews Neuroscience 2015;16:332-344. Blackmore ER, Putnam FW, Pressman EK, et al. The Effects of Trauma History and Prenatal Affective Symptoms on Obstetric Outcomes. J Trauma Stress 2016;29:245-252. Capron LE, Glover V, Pearson RM, et al. Associations of maternal and paternal antenatal mood with offspring anxiety disorder at age 18 years. J Affect Disord 2015;187:20-26. Clemens T, Dibben C. Living in stressful neighbourhoods during pregnancy: an observational study of crime rates and birth outcomes. Eur J Public Health 2016. Ellis BJ, Boyce WT. Differential susceptibility to the environment: toward an understanding of sensitivity to developmental experiences and context. Dev Psychopathol 2011;23:1-5. Ellis BJ, Boyce WT, Belsky J, et al. Differential susceptibility to the environment: an evolutionary neurodevelopmental theory. Dev Psychopathol 2011;23:7-28. Monk C, Feng T, Lee S, et al. Distress During Pregnancy: Epigenetic Regulation of Placenta Glucocorticoid-Related Genes and Fetal Neurobehavior. Am J Psychiatry 2016;173:705-713. Sandman CA, Davis EP. Neurobehavioral risk is associated with gestational exposure to stress hormones. Expert Rev Endocrinol Metab 2012;7:445-459. Vesterinen HM, Morello-Frosch R, Sen S, et al. Cumulative effects of prenatal-exposure to exogenous chemicals and psychosocial stress on fetal growth: Systematic-review of the human and animal evidence. PLoS One 2017;12:e0176331.